RADNOR, Pa.–(BUSINESS WIRE)– The J.G. Wentworth Company® (“J.G. Wentworth” or the “Company”) (OTCQX:JGWE) today announced a coalition with the New Mexico Lottery Authority that offers a new product in the retail market that combines both a virtual Visa® prepaid gift card and a Scratcher in one offering. STEP 1: An individual visits a retailer that sells scratch-off lottery tickets and purchases the Give Some! 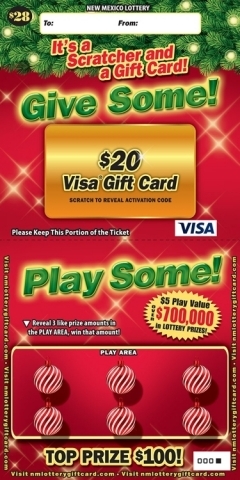 Play Some!™ Scratcher, receiving both a virtual Visa gift card valued at $20 – and a scratch-off lottery ticket as part of the purchase fee. STEP 2: The recipient gets to play the scratch-off game printed on the card’s packaging with a chance to win up to $100. STEP 3: The customer will visit an online account center to activate and redeem their $20 guaranteed value. Sean Healey, J.G. Wentworth’s Vice President of Payment Solutions, oversees the Company’s prepaid card division and has helped drive and shape the brand’s emerging role in the prepaid marketplace. The Give Some! Play Some!™ Visa® Prepaid Card is issued by MetaBank®, Member FDIC, pursuant to a license from Visa U.S.A. Inc. MetaBank, or Visa, is not responsible for lottery rules or winnings, nor does MetaBank, nor Visa, endorse or sponsor those offers. MetaBank is responsible for issuance of the Card and the terms of the related Cardholder Agreement. Card has fees that may reduce initial gift value.